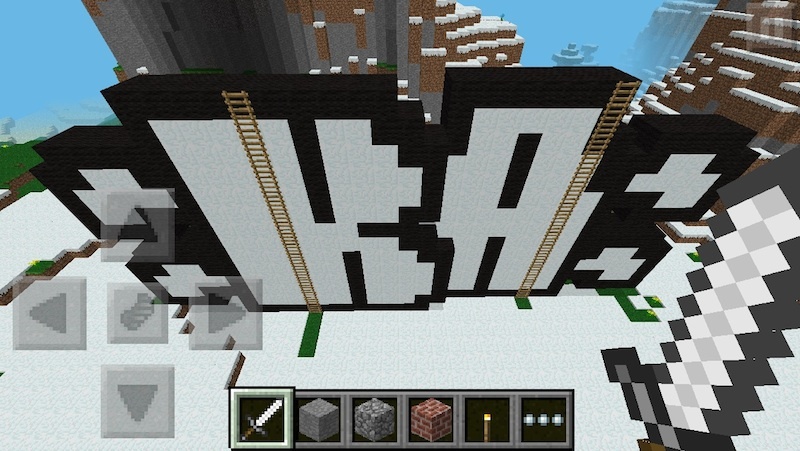 A KATSU throw-up in Minecraft. Screenshot by KATSU. Much KATSU’s work has already been mentioned, but some of his best work has so far only been described briefly in his interview section. This work deserves more detailed description and analysis. In addition to pieces like his tag on MOCA that are meant to be seen online but are actually painted on walls somewhere, KATSU has made a handful of works that have only ever existed digitally. In February 2010, this video appeared on YouTube of KATSU catching a tag just outside the White House. The 40-second video was quickly picked up and shared by fans of graffiti around the world, eventually getting over 100,000 views. A look at the comments on the video is kind of hilarious. It’s not always clear who is being genuine and who is just playing along, but it looks like a lot of people believe the video really shows KATSU catching a tag. To anyone paying close attention, it’s clear that the video is a hoax of sorts and that the tag was inserted into the video using video editing software. Hoax doesn’t really seem like the right word though, since KATSU was never really trying to convince the world that he had tagged the White House. He calls the video “a graffiti joke.” Whatever people believed, they shared it, and KATSU’s name was on everyone’s lips. Even if you knew the video was fake, it still seemed with sharing just to see who would be fooled, and because the trick was an impressive one. No, KATSU didn’t tag the White House, but he did get up. Then in April of 2010, KATSU took things a step further. This time, this next video was posted showing KATSU tagging over Picasso’s painting Girl Before a Mirror at the Museum of Modern Art in New York. It got even more views, almost 150,000 by November 2013. This video garnered the same response as the first, but perhaps even stronger. I remember when I first saw it and thought: “Oh my God, if this is real, I need to share it ASAP because KATSU is going to be on national television tonight and arrested tomorrow.” And the editing on this video was a bit better, so it wasn’t as obvious of a fake. Of course, this video was a hoax just like the last one. Still, KATSU got his name out there and associated with MoMA and Picasso without actually committing any crime. Again, people in the comments have debated if the video is real or not, and the graffiti community was quick to share it. These two faked videos each got significantly more views than The Powers of KATSU, even though that video shows KATSU doing actual graffiti. Graffiti is largely about risk, and with these videos KATSU was able to temporarily get the fame and attention of doing something very risky without ever actually putting himself take any risk at all. Like CDH’s Photoshop experiment, this was all a bit of a joke for KATSU, but it wouldn’t be far-fetched for a graffiti writer or street artist to digitally edit their work onto a wall, post it online and share it as if it were real. Even though the videos are a joke, they were more effective at achieving online fame for KATSU than documentation of traditional graffiti. But in a sense they are graffiti, because the videos treat the web as the same kind of playground and place for sharing as the street. While these videos aren’t invasive viral art or illegal, they are two of the most effective pieces of organic viral art I’ve ever seen from a graffiti writer, and they came out long before pretty much anyone else I know of was thinking about the internet as a place to do graffiti. KATSU and Theo Watson even released an iPhone app, Fat Tag Deluxe – Katsu Edition, which could be considered organic viral art as it is yet another way for KATSU’s logo and name to seep into our digital lives. The app is basically a doodling app centered around graffiti. There are options to make it look like you’re drawing with a spray can or a drippy marker and the default backgrounds to draw on include a Hello My Name Is sticker and a photo of an NYPD van (much like the pieces in CDH’s Photoshop experiment, but years earlier). The app’s logo is a KATSU skull, so anyone who downloads the app will always have a reminder of KATSU with them at all times. I’m sure there are other apps out there that do basically the same thing as Fat Tag Deluxe, but I know I’m only putting the KATSU version on my phone. The two added features are that works are stored in Graffiti Markup Language and that users can automatically upload their work to 000000book.com, a repository of GML files (here are KATSU’s uploads). While Faile and other artists have iPhone apps today, I’m not aware of any other graffiti writers or street artists who had their own iPhone apps when Fat Tag Deluxe – Katsu Edition was first released. I give KATSU a lot of credit; both for the work he has done and the work he has implied that he is setting out to do. Nobody else that I know of is saying things like, “The future of graffiti for me will be in the form of black hat tactics.” While he hasn’t transitioned to invasive viral art yet, it seems to be only a matter of time before that happens. Even looking just at his current resume, KATSU is clearly pushing the boundaries of what graffiti can be and taking advantage of the possibilities of the internet as best he can. If KATSU going in the direction he is headed and successfully transitions into making invasive viral art through “black hat tactics” while making the claim as a respected writer that his digital graffiti is still graffiti, he could go down as one of the most important graffiti writers yet.